After a year of sessions, medication discussion with GPs, seeking diagnosis, therapy, back and forth with the local council, Jenny (real name disguised) was waiting over 18 months to find out if the promise made to her was going to come true. This is one of many stories I’ve heard repeated again and again. The downside? Negative impact on the individual who was offered support, spiral into further depression and distrust in the system. Negative impact on the authority promising the support of people who contact them, trying to find out where their support is every day. It is often an unconscious design. The ‘service’, it’s there and mostly positive in the moment when you’re face to face with a doctor, a clinician, a psychologist, a therapist. But it’s the 'system' that’s letting you down. A disparity of misaligned touchpoints and communication points that don’t align to the journey you are on, taking your whole picture into consideration. The experience for you, it’s unconsciously badly designed. When it comes to mental health I’ve been fortunate to work on a variety of projects in this space. From researching how young people use technology and social media to manage their wellbeing for the NHS to working for the Department for Health, researching first hand stories of how people have experienced searching for work and how digital might provide mechanisms to scale mental health support for these groups. It has struck me time and time again that we’re uncovering similar insights. Patterns of insight and standard principles for service designs that should be considered in every design involving services around mental health. Patterns are an evidence-based solution to common design problems. From conversations I’ve had with people building tech products and services in the mental health space, agencies undertaking research and our clients who are doing the commissioning, there is lots we could learn from each other to build on the successful work to date. Rather than lengthy ‘best practice guides’ and case studies I feel there is an opportunity to take the pattern format and turn some of these evidenced learnings into design and service patterns to guide good design in the future for others setting out on the journey. Imagine we brought a handful of the best mindfulness app designers together, what might they be able to tell us about successful onboarding processes? How should we design positive notifications? What features work well to support users to manage their smartphone use? I understand that in some commercial scenarios, sharing patterns might not make sense but I take an optimistic, naive approach to seeing this as a common good approach for the public, as long as the patterns we are documenting aren’t ‘dark patterns’ coercing users into behaviour that isn’t positive for their wellbeing. Away from the specific mental health ’sector' that’s seen an explosion of apps and services with even the NHS’s own library promoting mental health apps, it could also be helpful to consider a wider application of principles to support more mindful technology design. "Value Human Attention. Recognise that any attention-based product impacts wellbeing." 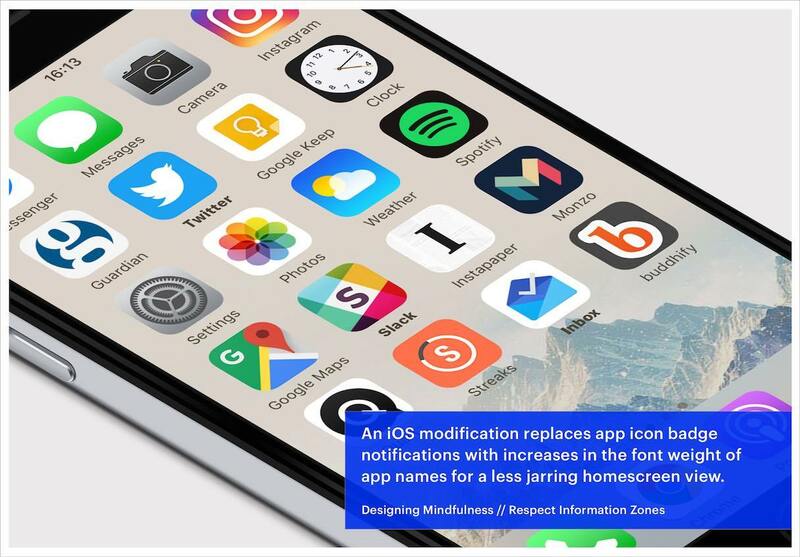 "For example, an iOS modification replaces app icon badge notifications with increases in the font weight of app names for a less jarring home screen view." Could shared principles like these provide us with better designed technology that supports wellbeing for it’s users? Obviously, this isn’t quite patterns, but principles applied to the product and service design process. I, for one, would be glad to see the end of the dopamine inducing red alerts on phones and Facebook. In our own work we’ve found repetitive principles when researching and trialling new mental health services. Considering the first story I shared, we’ve found consistent issue in leading users down long administrative paths to no end and dropping contact with users in services. No dead ends! Provide direct leads to enable users to access relevant support services or information. Provide users with actions to move forward with. Multiple points of access. Ensure effective links and points of access between online and offline resources and services, particularly at a local level. It was important for our team to highlight designing for the whole user experience and links between service touchpoints on- and offline, from the job centre to wellbeing self-assessment portals online. As the government looks to scale mental health services and how digital might enable this, they must consider the overall user experience, bridging multiple organisations operating within silos to meet the needs of often vulnerable users as one experience. Preparation. Prepare people by providing what information is needed for the next step of the journey they are embarking on. Principles are fairly easily assimilated from this work and conversations with other design teams. My next questions is how can we convene clients, makers, service users together to build not only principles but evidenced design patterns in the mental health space? And how will we make these relevant to others building technology and services in the future? If we could develop service patterns for the future, we might be able to use these in a policy context to demand organisations come together to proactively design and test their experience for users. Maybe, just maybe, if we had some resemblance of these in place, we might be able to reduce the distress that people like Jenni experience navigating the system of support. I’m currently plotting (and have been for the past 12 months) how to make this happen. If you’re interested drop me a line on Twitter and read more about our work on Snook. Sarah is the co-founder and managing director of Snook, an award-winning design consultancy working at the forefront of civic, public sector and democratic innovation. Sarah focuses on making social change happen by re-thinking public services from a human perspective and regularly lectures and speaks around the globe on service design, innovation and civic engagement. Sarah is a serial idea generator. 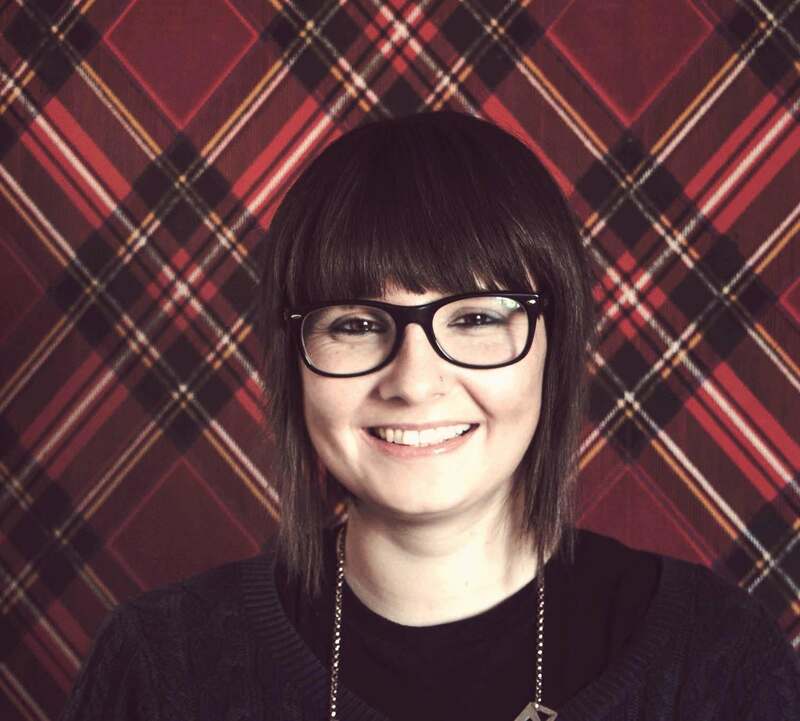 She has co-founded MyPolice, CycleHack, Dearest Scotland and The Matter. She was awarded a Google Fellowship for her work in technology and democracy.